Students from Civil Engineering on BINUS UNIVERSITY were crowned as the third winner in Environmentally Friendly Concrete Competition 2012, held at Jakarta State Polytechnic, Wednesday (4/4). They blended aggregate (rock) and fly ash (ash) with a specified composition to create a special concrete mix design. Head of Civil Engineering Laboratory Irpan Hidayat, ST, who also acted as advisor for the team, explained that environmentally friendly concrete is basically concrete which is created using materials which are not endangering the environment. “We want to prove this by using waste such as fly ash and aggregate,” Irpan says. The aggregate, Irpan continued, was created from a mixture of gravel, sand, cement and water. On another hand, fly ash is used as a substitute for cement. Here, the percentage of aggregate was reduced and substituted by concrete debris, construction waste. 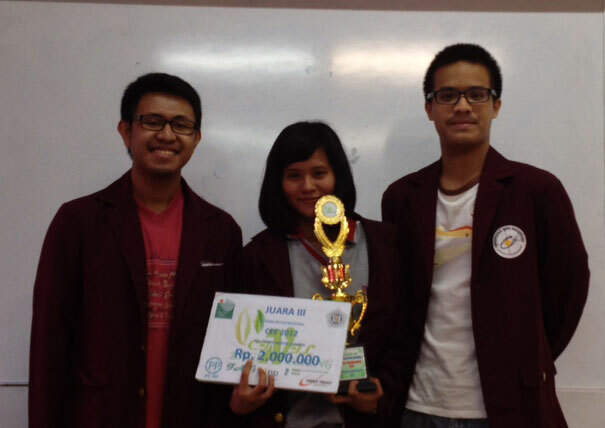 BINUS UNIVERSITY sent two teams, each consisting of three members. The first team reduced up to 20 percent of aggregate in total, while the second team reduced 30 percent of aggregate in total. “Each made three samples which are tested for 14 days and 28 days by using compression machine,” he said. Meanwhile, there are two factors being judged. 70 percent of the score comes from the test result and the rest of the score comes from presentation and economy value (pricing).